Frosty the Snowman, The Wicked Witch of the West, and the Wings of Icarus. What do these three have in common? If you said "they melted," you're ready to play TriBond. With over 1300 Threezer Riddles to solve, TriBond will bring you hours of challenging fun. With over 2 million copies sold, pick up your own and see for yourself what all the talk is about! Play the lateral thought game that has everyone thinking in threes! For example, what do these 3 have in common? 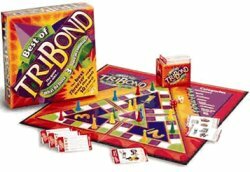 tribond.com – Official home page for the Tribond games, with background information, rules, frequently asked questions, and more. There's even an online version of the game.